Freedom Lane [G1891] - $13.00 : Yarn Tree, Your wholesale source for cross stitch supplies. Cross stitch pattern by Twin Peak Primitives. Look down the lane at the flags flying in the hot summer sky. They fly above two houses, filled with family & friends celebrating their freedom. A beautiful white barn sits further down the lane, with it's doors wide open, welcoming in the summer breeze. Outside, the barn is decorated in red, white & blue. Mr. & Mrs. dressed in their red, white & blue, hold hands outside the barn. 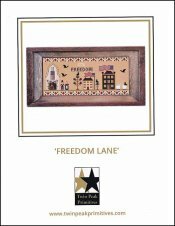 Welcome to "Freedom Lane." Stitch count is 189W x 75H.